The Oregon Health & Science University (Portland, OR) has again purchased monkeys from Worldwide Primates, a Miami-based laboratory animal supplier with a horrible history. 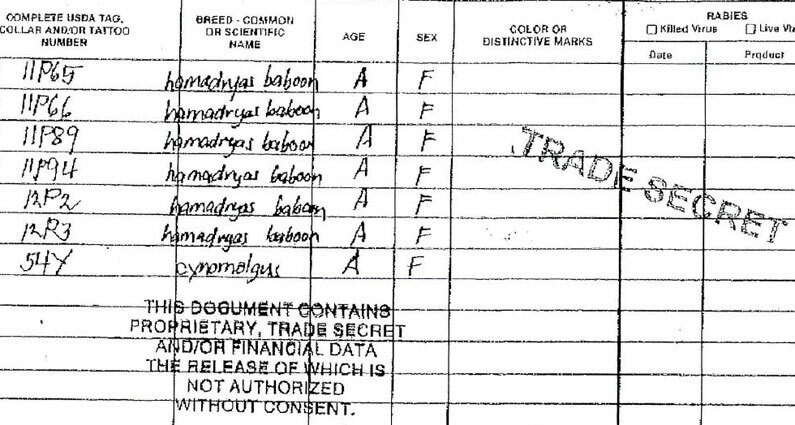 In response to a public records request, ARFF has received copies of paperwork filed by Worldwide Primates with the Oregon Department of Agriculture detailing a shipment of 12 baboons and four crab-eating macaques from Florida to Oregon. A similar shipment of 27 monkeys in September 2015 was the subject of an article by InvestigateWest (the article also highlighted Oregon’s public records exemption for information about animal research at OHSU). Miami-based Worldwide Primates is one of the country’s largest importers of monkeys for use in experimentation. The company is run by Matt Block, who was sent to prison in the 1990s after being convicted of smuggling endangered wildlife (baby orangutans) in the infamous “Bangkok Six” case.